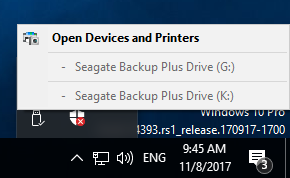 After plugging a couple of Seagate Backup Plus external drives in Windows 10 system, there's no option to Eject them. Aside from shutting down the system, are there other official ways of doing it? Re: how to eject external drives (Win10) if no 'Eject' option? A. close all explorers, apps that utilize the external HD.